Many users found the power option missing in the start menu after Windows 10 Creators Update. All the power options are not available in Win 10 CU when you clicking on the power option in the start menu, you may no longer see the Sleep/Shut Down/Restart option. 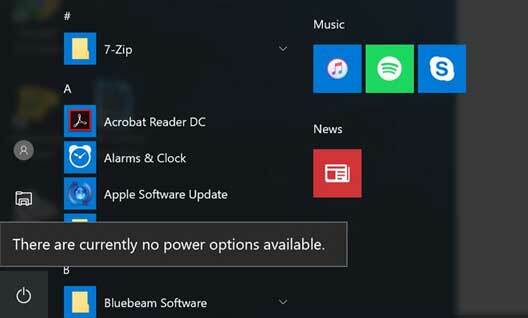 Instead, you’ll get a message, saying “There are currently no power options available.” The only way to sleep/shutdown your computer is to log out since the power options are available on the sign in the interface. To get rid of the useless Windows 10 power options and find those features back, below are a few tricks for your reference. 1. Press Win + X to select Command Prompt (Admin). 3. Type powercfg –restoredefaultschemes after the sfc /scannow command completes and then hit Enter. 4. Type DISM /Online /Cleanup-Image /RestoreHealth and hit Enter. 5. Reboot your computer after the process finishes and then try the Sleep, Shut down or restart option in the power menu to check whether the power options are available now. 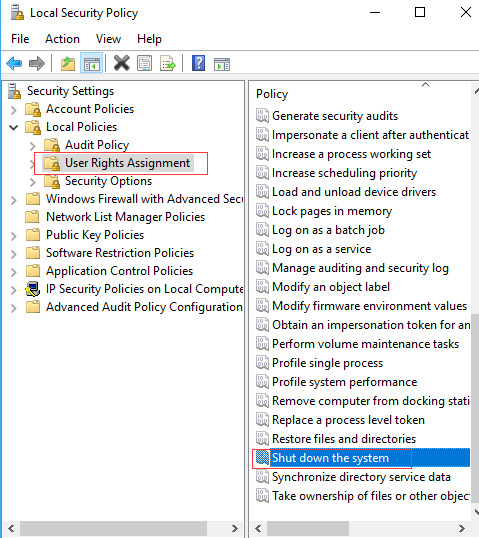 If running the SFC commands fails to fix the futile power options in Windows 10, try the Group Policy Editor tweak as below tutorials. Before the registry tweak, you’d better backup your registry first in case of any further system issues like blue screen, black screen with cursor, Windows Hello not working etc. 1. Go to Search, type gpedit.msc to open Group Policy Editor. 3. Double-click on "Remove and Prevent Access to the Shut Down command". 4. Select “Not Configured” or “Disabled” and then click Apply. 5. 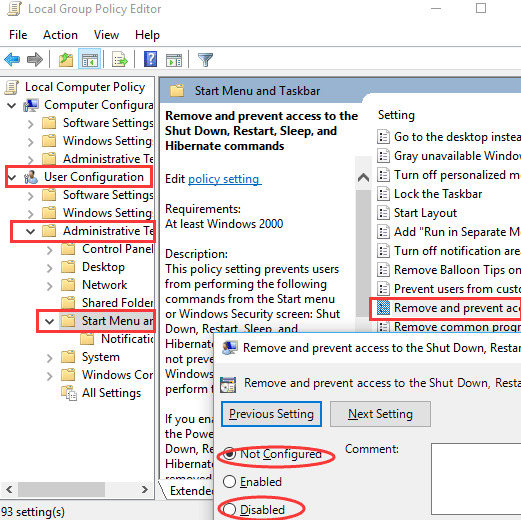 Close the Group Policy Editor and then try the power options menu to see if the sleep/hibernate/restart option functions now. Ensure that a value named NoClose exists with a value of 0. Reboot your computer and check whether the Power Options missing bug gets fixed. 1. Press Win + R keys and type: secpol.msc and then hit Enter to open the Local Security Policy. 2. Go to: Security Settings –> Local Policies –> User Rights Assignment –> Shut down the system. 3. 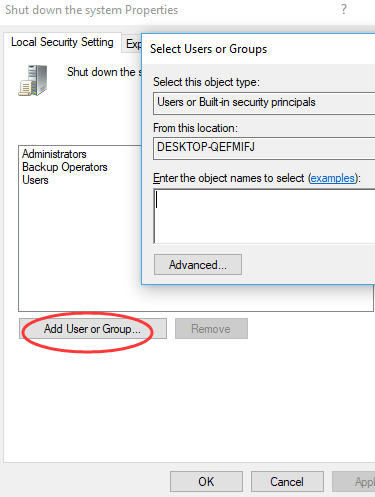 Choose Properties and then Add Users or Group to add your user id or group. 4. Once the new user or group has been added, click OK to save changes. 5. Sign out and Restart your computer. 6. Sign in and then you should find the Restart & Shutdown options are available. Incompatible drivers can result in issues like unresponsive power options menu, cursor disappearing, CHKDSK /F/R not working, mouse lagging etc. after Win 10 CU. 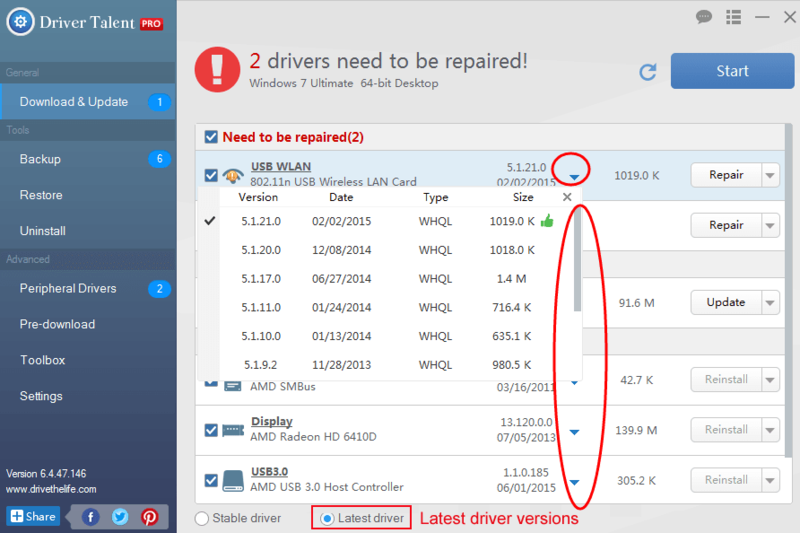 To update your device drivers to match the Windows 10 Creators Update and resolve the glitchy power options from start menu via a time and energy saving way, we recommend you to use a professional driver update and management utility, like Driver Talent. 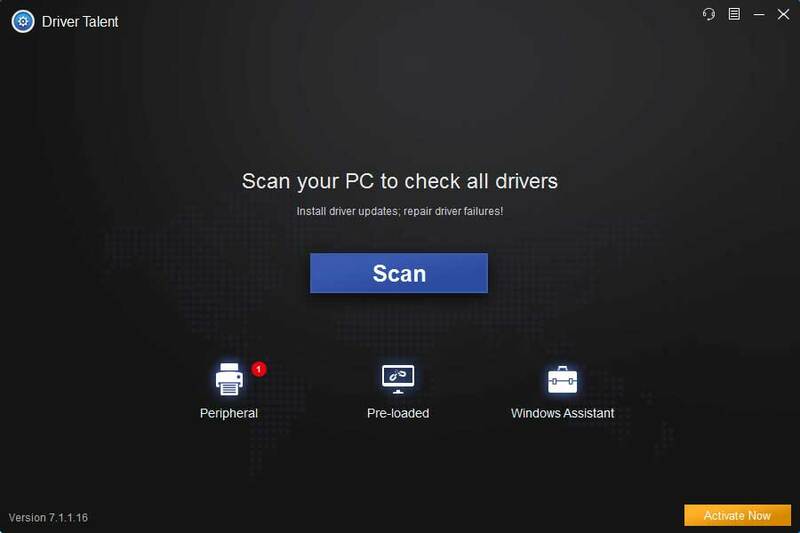 Favored by millions of people worldwide, Driver Talent detects your problematic drivers and then fixes them by downloading the best-matched drivers for Windows computer. Click the button below to grab Driver Talent immediately. Follow the steps to update drivers and troubleshoot the power options no longer available problem on Windows 10 CU. Click “scan” and Driver Talent will scan for all the drivers installed on Windows 10 Creators Update. All the problematic drivers will show to you after step 1. Click “Download” or “Update” to install the proper drivers and solve unresponsive power options hitch for Windows 10. Notes: Backup your drivers in advance in case you want to roll back drivers in the future. Restart your Windows 10 Creators Update laptop or desktop PC to make the updated driver take effect. Above are all troubleshooters we find to fix Power Options Missing after Windows 10 Creators Update. If you know more solutions on the unresponsive power options problem, please share with us in the comment section below, or go to the OStoto official forum for further discussion via the left menu on the page.